I want to spend a moment encouraging golfers to build a 30-minute practice regime into their routines at least once a week. Don’t stop reading now. And if you already practice, don’t stop reading. I want you to practice a routine that I can guarantee will lower your scores, whatever your current handicap. I want you to set up for 20 minutes of practicing hitting targets that are 30, 40, 50, 60, 70 yards away. You want to find the club that works with either a half or full swing with the respective distances and make a mental note of which club and which swing is your go-to for each of those distances. Start the session and find your rhythm by working up from the 30 yards target. Then spend the final 10 minutes switching between targets. Score your performance in whatever way you want, but end the 10 minutes with a score you can measure against your next practice session. Then find a practice green and stand about 15 yards off the green and spend 10 minutes Chipping at a target on the green. Dave Pelz’s research indicates that this is one of the most common shots you’ll face on the golf course.I’d like some of you to take this 30-minute practice regime on board at least once a week and then after 8 weeks, let me know how much of a difference it has made to your game and scores. I’d also like you to think about coming and having a brush-up lesson. There are simple techniques that will make these shots so much easier and lead to big improvements in your consistency. You’ve hit a great drive on a long Par 4 and now stand middle of the Fairway, #5 Iron distance to the flag. Front right is water, close left is a deep bunker. So what club are you going to play? If you have a stroke: That water is there because most double figure handicap golfers will hit their longer clubs short with a tendency to lose it short and right. If you are a double figure handicapper then consider taking a short Iron that leaves you safely in the Fairway with no danger of finding the water and then you have a short pitch to the green. Get it close and you have a chance of a net birdie. If you don’t have a stroke: You should play for the green making sure you are aiming full (no chance of finding the water) and right side (avoiding the bunker). Pull it off and you are Putting for a birdie. Miss the green either long or right and you have a simple, short chip back which, with an up and down, will leave you with a Par. 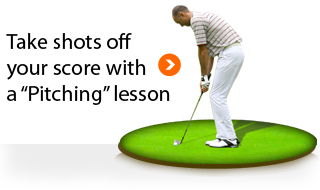 In both of these examples having command of your short-game gives you great advantages. 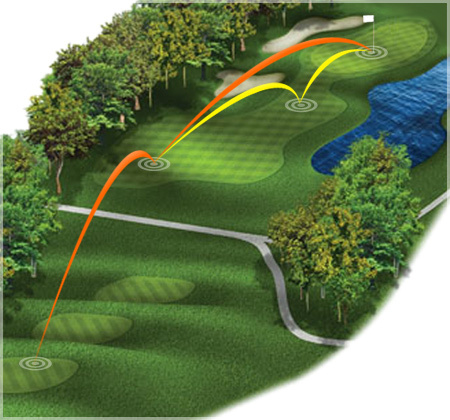 For the player with the stroke, it really increases the chance of a net birdie. For the better player it reduces the risk of a bogey. If you were to chart the practice time of the best players, you would find that they invest a large percentage of their practice on the short-game. If you want to improve your golf scores then first, invest time in your short-game, and then use the advantage that gives you to think your way around the golf course.